THE SECRET LIVES OF PRINCESSES brings elements of Aladdin (one of my favorite fairy tales) into today's society. Jasmine has always had trouble figuring out who she really is. She feels like she constantly puts on a facade because her home life isn't as great as it seems. At school, everything seems perfect to others, except Ollie. Ollie is the school bad boy and Jasmine's worst enemy. However, no matter how irritating he his, Ollie challenges Jasmine in a new way with the upcoming art project at school. He encourages her to become better. A romance may not be encouraged between these two people, but that doesn't stop it from blossoming. What Jasmine doesn't know is Ollie has a secret that will change everything, especially the way she sees him. The is my first book by Seven Steps, but I'm interested in reading the others as well. I love fairytale retellings and Seven Steps does it in a unique way. Her book contains elements of the original Aladdin story, but she keeps it modern. The story takes place in a high school instead of the desert sands. I absolutely loved Ollie's character. Yes, I'm a sucker for the bad boys, but there was something different about him that held my attention. I also could relate to Jasmine's character. Both of their characters are believable and realistic which keeps us grounded in the real world instead of the magic of fairy tales. Final Verdict: I would recommend this to fans of Aladdin, contemporary romance, bad boys, and realistic characters. 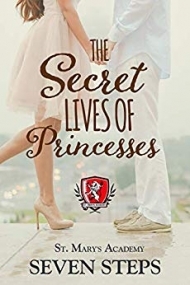 'The Secret Lives of Princesses' by Seven Steps is yet another enjoyable addition to the St. Mary's Academy series of books. Main character Jasmine Patel knows what she wants out of life, but she isn't quite sure how to take charge and make it all happen. Worry envelops her as she wonders how to tell her parents about her desire to be a painter and not a doctor when she grows up, and how to break the same news to Andrew, the guy she likes, when he takes an interest in her. Besides her friends, she doesn't seem to have much support from the outside world in terms of her aspirations, which flummoxes her since she feels so strongly about those goals. Enter Oliver Santiago, better known as Ollie, who inspires Jasmine in ways she didn't know were possible, but irritates her even more. She can't wrap her head around why he is so ridiculously down on co-winning an art mural contest with her, but she finds herself constantly partnered with him by means of their art teacher. Finding a way to work together allows Jasmine to let her walls down a little bit, but this only causes tension between her and new beau Andrew as she struggles to figure out what she really wants for herself and how to best go about achieving it. With her friends by her side, she discovers that her parents are closer to divorce than she thought, and when her mother decides to take unexpected interest in her life, everything seems doomed. However, at every point in the story where doom seemed imminent, a bright light always came through, even taking into account Jasmine's insistence to herself that everything is constantly bound to go wrong. Despite the fact that the book was quite lengthy and could have likely been pared down quite a bit, there were also a few scenes that could have used some further elaboration. However, the story is interesting and will keep readers invested in finding out what will happen to Jasmine, Ollie, and Andrew, along with Jasmine's friends and family. A creative take on another Disney classic, 'The Secret Lives of Princesses' proves that one's determination and insistence on achieving one's goals are paramount to success. The story is interesting and will keep readers invested in finding out what will happen to Jasmine, Ollie, and Andrew, along with Jasmine's friends and family. A creative take on another Disney classic, 'The Secret Lives of Princesses' proves that one's determination and insistence on achieving one's goals are paramount to success.